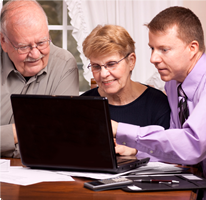 Are your clients looking for a choice when it comes to group or individual Medicare coverage? We have options. Take a look at what types of coverage individuals can enjoy with CDPHP Medicare Advantage. These plans are available to eligible individuals who have both Medicare Parts A and B and reside in one of the following counties in New York state: Albany, Broome, Chenango, Clinton, Columbia, Delaware, Essex, Franklin, Fulton, Greene, Hamilton, Herkimer, Madison, Montgomery, Oneida, Otsego, Rensselaer, Saratoga, Schenectady, Schoharie, Tioga, Warren, or Washington. Sales and account management teams that are specially trained in retiree benefits to be a resource for brokers and employers. HMO or PPO benefit plan options with the ability to create a custom offering for large employer groups. Comprehensive benefits such as predictable copays or coinsurance and no-cost preventive services, including annual wellness visits, screenings, and immunizations. Value-added benefits including routine eye exams and hearing tests, plus an allowance toward eyewear and hearing aids. Worldwide coverage for emergency and urgently needed care. Preventive dental rider options including new Delta Dental preventive riders for 2019. Through CDPHP® Senior Fit®, Medicare Advantage members have no-cost access to numerous programs, gyms, and wellness centers where they can exercise, socialize, and improve their lifestyle. These plans are available to eligible individuals who have both Medicare Parts A and B and reside in one of the following counties in New York state: Albany, Broome, Chenango, Clinton, Columbia, Delaware, Dutchess, Essex, Franklin, Fulton, Greene, Hamilton, Herkimer, Madison, Montgomery, Oneida, Orange, Otsego, Rensselaer, Saratoga, Schenectady, Schoharie, Tioga, Ulster, Warren, or Washington.